Like the White Ferns, New Zealand’s Men team managed to win a thriller in Hamilton. The Indian Women’s team fell two runs short of the chase earlier in the day while Rohit Sharma‘s men could manage four runs less than their opposition later in the day. The hosts managed to keep their nerves in the crunch moments in both the games and ended up winning the series eventually. At one stage, the Kiwis were off to a comfortable victory it seemed. But Krunal Pandya and Dinesh Karthik got together with 68 runs needing off the last five overs and took the game till the end. They targetted the bowlers smartly and brought the equation down to 16 in the final over. But Tim Southee’s experience helped New Zealand restrict the duo in the end. Earlier, brief blitz from Rishabh Pant and Hardik Pandya kept the visitors in the game while Rohit Sharma played second fiddle to them. But the latter’s wicket at the wrong time stalled India’s momentum remarkably and despite Karthik-Krunal partnership, India fell short to lose a close series. Earlier, after being put in to bat first, Tim Seifert and Colin Munro took full toll of the flat pitch on offer. They smacked the ball through the line to leave the visitors finding for cover. Despite Seifert getting out to some smart work from MS Dhoni, Munro kept hitting the ball and cleanly and was also helped with a few drop catches from the visitors. 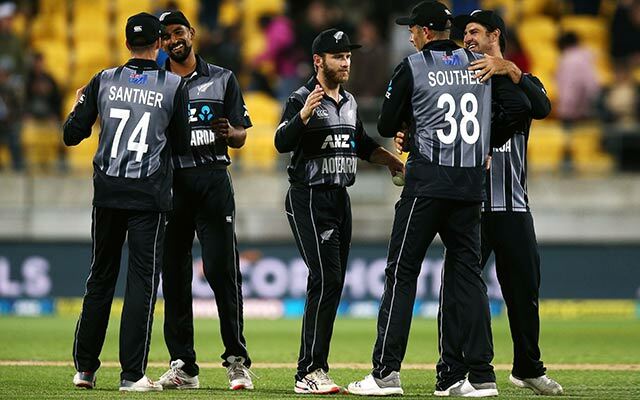 The middle-order also added some important runs to the cause as the Kiwis comfortably crossed the 200-run mark for the second time in the series. Kuldeep Yadav was exceptional with his bowling as New Zealand could never pick him and he brilliantly scalped a couple of important wickets in the innings. Eventually, it wasn’t enough as the home team scored a little too much. Great to have a performance like that, but it’s great to get a victory, particularly a last-minute one like that. Great to have batted with Colin Munro. It’s awesome in my hometown, that the crowd have come out in full support – hopefully they do so for the Super Smash final as well. Touch and go there until the final minute. India – you get one good batsman, another one comes along. The boys did a really good job of finishing off the really good Indian batsmen. Didn’t really focus on trying to do anything different, tried to put pressure back on the bowlers. Just came out nice and free, had a bit of luck, which you certainly need in this match. What a brilliant advertisement for T20 cricket. It’s great to get across the line tonight. It was a fairly short series. The first performance (first T20I) was our best, and there were some learnings in the second one. We knew India would come back strong. For it to go to the last couple of balls with the series on the line, it was a great series to be a part of. The nature of international cricket is such that there is an ODI series against Bangladesh, so looking forward to that as well. We started off well in the ODIs, and the boys will be disappointed not getting to the finishing line in the T20s. Lots of positives, and a few mistakes, so there’s a lot of material to move ahead. It would have been nice to win the series and go home and play Australia, but unfortunately, we couldn’t do that.